Over 100 farmers continued Tuesday blocking roads leading to Canadian miner Candente Copper Corp.’s Canariaco copper project, after a clash with police Friday left at least four injured. According to Peru’s government officials quoted by Terra.com (in Spanish), the crowd is lead by some of the same organizers of rallies against Newmont Mining’s (NYSE:NEM) $5 billion Conga project. The demonstrations are focused in the Lambayeque region of northern Peru, where Candente’s mining camp is located. The most lauded case has been Newmont Mining’s Conga. 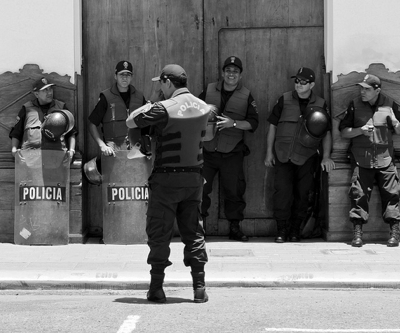 Last year international human rights groups criticized Peru's government for so swiftly using live ammunition against picketers after five were killed in anti-Conga protests in July last year. The project is on hold until the company finishes building water reservoirs that will help reduce local concerns about pollution to current water supplies by the mine activities. Vancouver-based Candente Copper (TSX:DNT) has said it obtained approval from more than 700 locals in July last year. However, local authorities claim the community rejected the mine in a referendum. Peru is one of the world's largest producers of silver, gold, copper, zinc and other minerals. But as a result of almost a year of non-stop anti-mining protests in different regions, investors had started looking for greener pastures, said Peru’s mining, oil and energy society (SNMPE) last September.